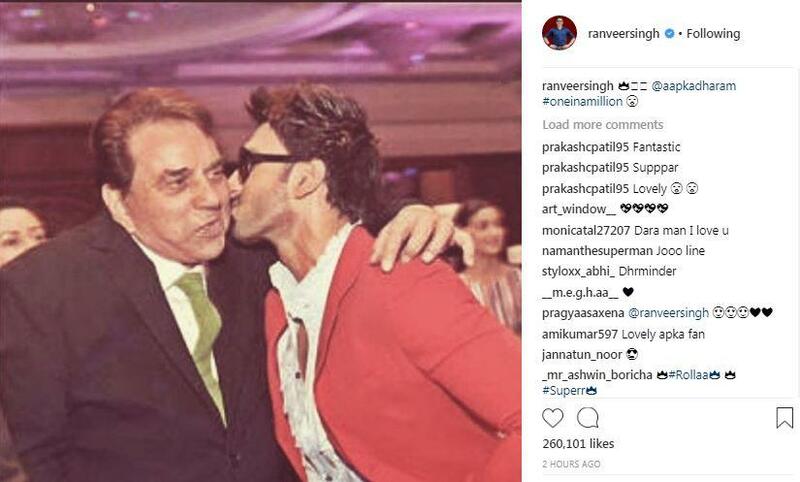 Bollywood powerhouse Ranveer Singh is all hearts for the 'one in a million' actor Dharmendra. 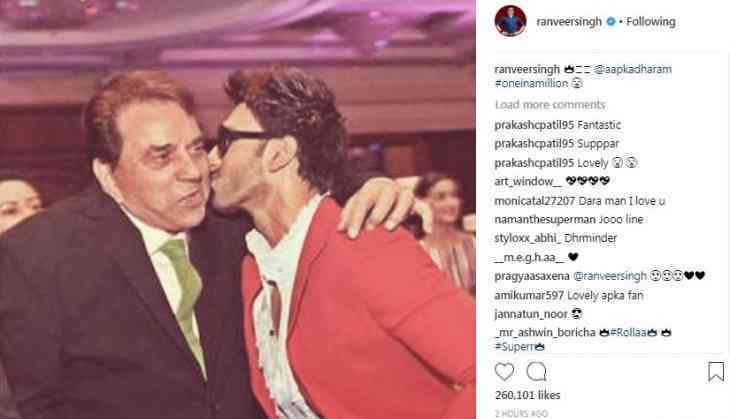 The 'Padmaavat' star shared a throwback picture on his Instagram where he can be seen giving a peck on the veteran actor's cheek. Dressed in a red and white tuxedo, Singh looks his dapper best alongside Dharmendra in a formal suit. On the work front, Singh is all set for Rohit Shetty's 'Simmba' which is a remake of 2015 Telugu blockbuster 'Temper'. Produced by Karan Johar, the flick will hit the big screens on December 28 this year and will mark the debut of Sara Ali Khan. Dharmendra, on the other hand, will next be seen in 'Yamla Pagla Deewana Phir Se'. The comedy-drama brings together the 'Sholay' star and his sons Sunny and Bobby Deol. Helmed by Navaniat Singh, the film will hit the big screens on August 31.